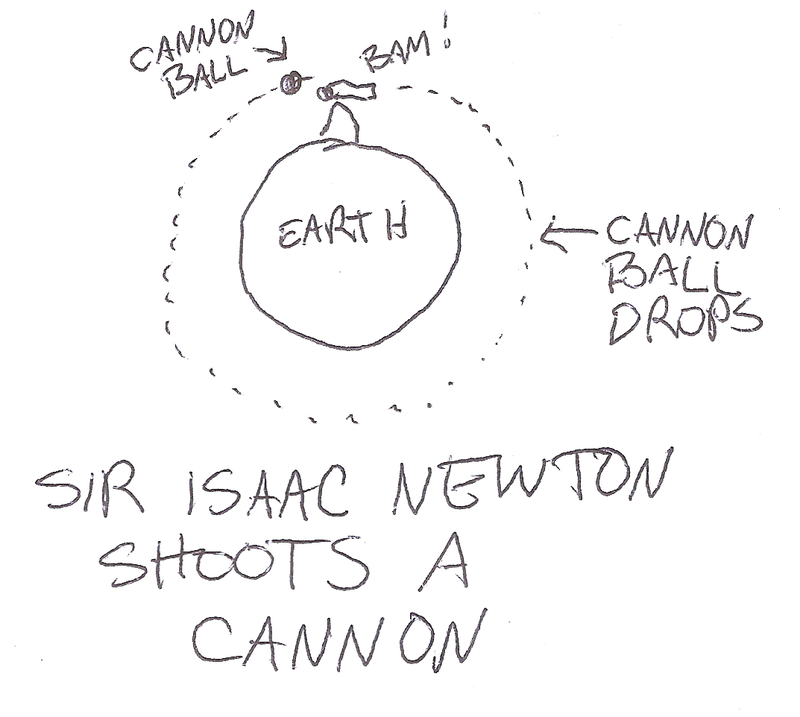 In two previous blog posts about Newton’s Cannon and Joe Drops the Ball I posed the question: If falling objects go faster and faster, why don’t orbiting objects fall out of orbit and crash to the ground? The question is legitimate and also has a perfectly legitimate explanation. The rate of a falling object is 32.2 feet per second per second, i.e. it goes faster and faster as it goes down. It accelerates on the way to the ground. So the first question is this: 1) Is an object in orbit in free fall? The answer is yes. 2) Do falling objects accelerate as they fall to the ground? The answer is yes. 3) Do orbiting objects accelerate and thus fall to the ground? The answer is no. It’s all in the definition of accelerate. Acceleration is a change in velocity not just a change in speed. Velocity is the speed in a given direction, but because an object in orbit is always changing direction it is technically accelerating even if it’s speed isn’t changing. The force of gravity bending the forward motion of the orbiting object changes the direction of the object. The object is accelerating even if it’s speed isn’t changing, because it is constantly changing direction. This is alternatively explained in the article I wrote called The Little Rocket that Was.